The description in English is here. Click “Download” icon to get the current stable version. 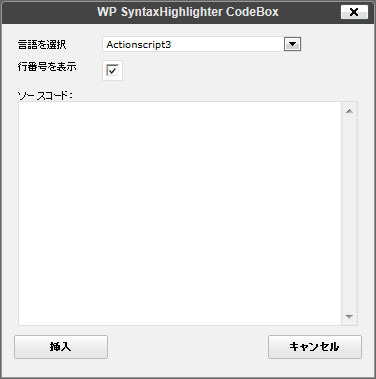 $plugin_name = 'Lang_Pack_for_WP_SyntaxHighlighter'; // Plugin name without spaces. $version = '1.0'; // Plugin version. When you modify this file, you must increase the version. // Add new brush files. // Language: It must be a unique name. // Possible version: Possible SyntaxHighlighter version. Possible value is 3.0, 2.1 or all. $wp_sh_brush_files['Lua'] = array($add_nl_plugin_url. 'lua/shBrushLua.js', 'lua', '3.0', 'added'); // Only for SyntaxHighlighter 3.0. // Add new languages to language list at the click of buttons. For ver. 3.0. //Language name: It must be a unique name. It will be appeared in language list at the click of buttons. // Add new languages to language list at the click of buttons. For ver. 2.1. // If any css for new languages files, add them. // Language: Same value as "Add new brush files" part.